Crafting plans... - I see better from a distance. This summer has been a bust for me creatively. I've hardly done any cross stitching or beading. I guess I was burned out for a bit. Anyway, I have some new ideas and more new supplies. I'm going to make some resin pieces in the next few weeks. I have some new molds and I know what I want to put in them! I bought some licorice scottie dogs for one project, and will use candy "conversation hearts" for another. I'd never thought of using candies in jewelry before! Every time I find something good at Michaels, they discontinue it. In the art section, they had a rack of supplies for "artist trading cards"- little glass bottles filled with glitter or beads. Since they were marked down, I got tons of them! 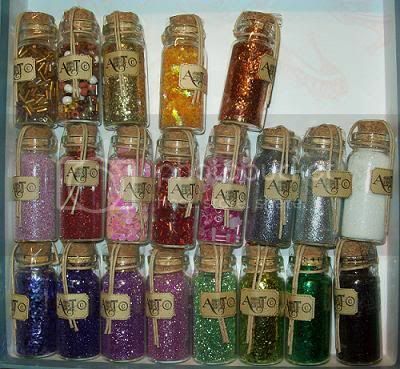 When the glitter is used up, I can reuse the bottles to make pendants.